Geotechnical design input parameters, such as in situ stress field, rock mass strength parameters and deformation modulus, are never known precisely. There are always uncertainties involved in these parameters, some are intrinsic and others are due to lack of knowledge or understanding of these parameters. To quantify the effects of these uncertainties on tunnel and cavern design, it is necessary to utilize probabilistic analysis methods. In the present study, a quantitative, probabilistic approach to use the Geological Strength Index (GSI) system for rock mass characterization is presented. It employs the block volume and a joint condition factor as quantitative characterization factors to determine the GSI values. The approach is built on the linkage between descriptive geological terms and measurable field parameters such as joint spacing and joint roughness, which are random variables. Using GSI values obtained from field mapping data, and in combination with the intact rock strength properties, the probability density distributions of rock mass strength parameters and elastic moduli of the jointed rock mass can be calculated using Monte Carlo method. Furthermore, probabilistic analysis of tunnel and cavern stability based on the variable input parameters is conducted employing the point estimate method. One example is given to illustrate how to consider the variability of in situ stress and the rock mass properties in tunnel and cavern design. 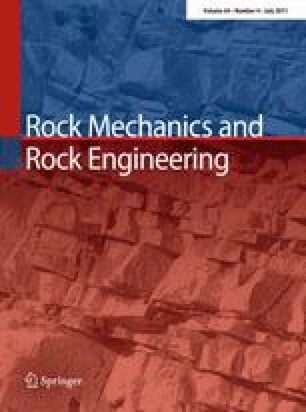 The method presents an approach for systematic assessment of uncertainty in rock mass characterization in rock engineering, and it can assist us to better understand how uncertainty arises and how the rock support system design decision may be affected by it. The method and analysis presented in this paper were carried out to illustrate the probabilistic design approach and did not necessarily reflect the design approach adopted by Tokyo Electric Power Services Co. Ltd. (TEPSCO) and Tokyo Electric Power Company (TEPCO). The author would like to thank TEPSCO and TEPCO for previous support on the application of the GSI system for rock mass characterization.